Dream walk with Sharon and my Dad along a mesa dirt road lined with blue-green chamisas, thistles and flowering apache plumes, a porch of an old adobe house appears supported by two stripped tree truck posts. My Dad takes hold of one post and shakes it, testing its strength, and loosens one end of a rough wooden ladder that falls at my feet. Upward I gaze at the ceiling of the porch, seeing the ladder leads to a hidden trapdoor. I wonder where it goes as I look around the corner to see an old adobe house with a second story floor. 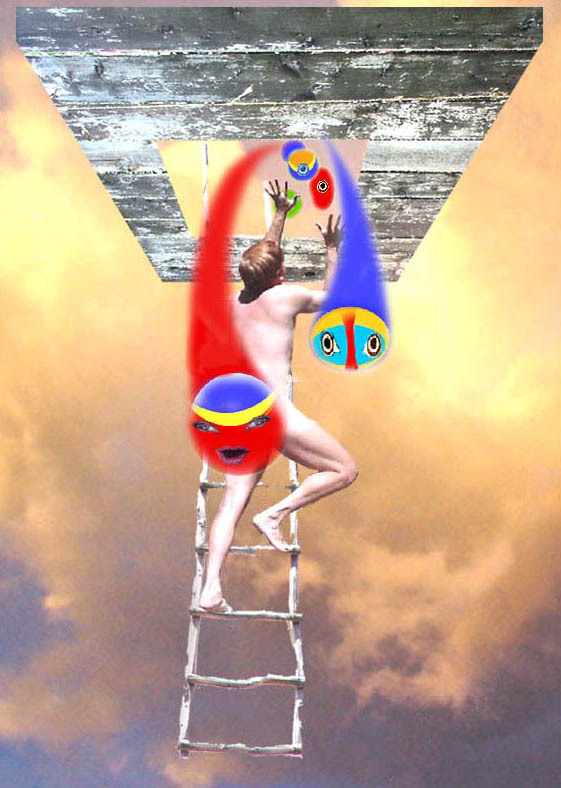 I;m afraid as I step on the first rung of the ladder and suddenly everything changes, I’m alone and feel naked. I continue up step by step. I reach the ceiling and push on the wooden door. Dirt falls from the edges of the crack and a bright light blinds me momentarily. I stop and wonder what’s on the other side and then slowly push. As it opens hundreds of strange colored faced demons rush towards my face, eyes open wide and screeching. I want to retreat but continue on up when I discover the demons can’t hurt me but only scare me. I push the door open all the way as I climb the ladder. I quickly look around as I take my first step onto the floor above the ceiling. The demons are gone and I’m in the end portion of a transept within a large cathedral. The transept appears darker now as I turn and start walking towards the nave. There are little chapel rooms along both sides, all lit with candles. I walk slowly thinking about how differently this appeared from the outside, the long adobe house. One of the chapels is filled with dolls and other children’s toys. It is dark and enclosed with glass and heavy chains crisscrossing the front of the chapel. I translated that as I wouldn’t be having any children. Approaching the nave the light became more intense. When I turned the corner and stepped into the nave the light became brilliant. I had to look downward until my eyes could adjust. I was instantly filled with joy and excitement as I moved further into the nave. The walls were so bright I didn’t notice at first that they were made up of little intensely lit crystalline doors with little knobs, millions of them, each about six inches high by four inches wide. I looked upward to see that the crystalline doors extended upward, unending on both nave walls, as far as I could see getting brighter and brighter. Suddenly I felt that I was with God, God was with me. I sat down on the floor near the wall and enjoyed the feelings of “withness.” Then I realized that within each little crystalline door was creative knowledge about God. I also felt that God was allowing me to open any of the little doors, but I didn’t feel the need to do so. What could I gain more than what I was now experiencing? After sitting there, for I don’t know how long, I was led to go to the altar at the front of the cathedral. There a red cloak was placed on my shoulders and I felt I was ordained to be a minister of creativity about God. The lake was calm and gray, reflecting the overcast sky. Slightly bobbing in the water was what appeared to be a Viking long-boat without oars or a mast. The deck was wooden and highly polished and slick. In the middle of the deck was a circular hole about four feet in diameter and covered with a seal. I intuitively knew that if the seal was broken, water would rush in and sink the boat. I wandered about the deck looking in all directions, but couldn’t see any distant shoreline. As I gazed out over the peaceful water, I felt the boat suddenly began rocking. I turned around just in time to see a large muscular man coming towards me. I quickly sorted out my options, but staying on the boat seemed the only sane thing to do. Although I wondered how long I would last with this aggressive man heading my way. Then we abruptly engaged in a wrestlers hold. To my surprise, I found that I could hold my own against him. We struggled with one another for maybe an hour, moving about the slippery polished yellow-orange wooden deck. I realized that there was not going to be a resolution to this conflict, it was going to continue until one of us became exhausted. We continued on and on. I remembered that if the seal was broken in the center of the boat the fight would end, but then we probably both would drown; so that wasn’t an alternative. Somehow, I also realized that I was struggling against evil. I remember thinking many times that I could be more productive in my life if I didn’t have so many emotional weeds to deal with, but those weeds also gave me content in my life and stimulated passion. I now started thinking about my other dreams and how, when put together, seemed to be expressing knowledge about levels of spiritual awareness, especially the one that I labeled “a very personal luminescent dream.” (above) Did this dream have anything to do with the young woman I just crossed paths with, Julietta? (on the “Story” page ) I wondered if she was involved with something evil that I was subconsciously picking up. If this latest dream was true, I was going to be in a long drawn out struggle or relationship with Julietta.